Muddy: volunteers started the day assembling hundreds of tree guards. Note how wet the ground is behind them. Late in August, a group of the Friends joined forces with the Longley Landcare Group and the council to plant around 2,000 trees and shrubs along a bare patch of the rail trail near Junortoun. Even before the deluge of last weekend, it was soft and muddy and no one came out of the exercise clean. 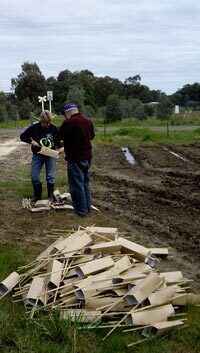 The Landcare volunteers were obviously experienced hands and the Friends picked up some good tips for the next tree planting. Once all the hard, wet work was over our Landcare hosts put on a barbeque. There will be more tree plantings along the trail as it develops and willing hands are always welcome. We’ll let you know when the next one is coming up. In the meantime, we hope all our little plants don’t drown.